Before you continue viewing this web site, we suggest that you go to "My Story" by Nelson Vergel for background information. 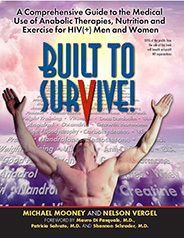 Nelson's personal story will give you a basic understanding of how anabolic therapies, nutrition, and exercise are used in the fight against HIV. Read the Baltimore Sun interview with Nelson. Editor & Publisher of this site. Cure For AIDS Found In Leukemia Therapy? HIV Lipodystrophy: Where are we after 10 years? Metabolic Effects of Nandrolone and Weight Training, A Study by Sattler, et al.